After months of speculation and anticipation, tomorrow, the day finally arrives: It's Kobayashi vs. Chestnut, for the Coney Island Hot Dog Eating Championship. As you pore over the tale of the tape and analyze the weigh-in numbers, we remind you what is on the line. 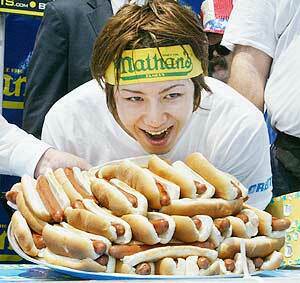 Kobayashi has never been defeated since revolutionizing the sport in 2001 by eating 50 hot dogs. His record came last year, when he put down 53 3/4 in 12 minutes; you don't want to know what happened to that last fourth. But American Joey Chestnut, one month ago, broke his all-time record with 59 1/2. But he didn't do it on the biggest stage. And now Kobayashi has jaw problems. It's the biggest day in the history of competitive eating, and we're typing that with an entirely straight face. And we couldn't be more excited, because we're going to be there. We'll be heading down to Coney Island for the big event, our first in-person viewing, and we can't wait. We're taking tomorrow off here at the site, but we'll be back Thursday with a full, glorious report. Our money remains on Kobayashi; as a wise man once said, to be the man, you have to beat the man.